People often ask, “What do you mean by a “Third Space? The term Third Space or Third Place was coined by the sociologist Ray Oldenburg in the early 90s in his book The Great Good Place. It’s a space where people meet to unwind, discuss and talk about things that matter to them, their neighbourhood and their community, where they can let down their guard, relax, be themselves, develop new friendships and deepen existing ones. It’s a space distinct both from the work environment where communication and interaction can be functional, stereotyped and superficial and distinct from the domestic space of home and family life. Third spaces have been ways “a community develops and retains a sense of cohesion and identity”. They are about sociability, not isolation. All sorts of social groupings can have aspects of a third space – clubs, book groups, churches and so on. Informal spaces where people meet in less-defined groupings can nurture the sort of ambiance that people are looking for in a third space – the classic example is the British local pub. These are all marked by “easygoing conviviality and safety”. Open, welcoming and accessible to the neighbourhood. An ambiance that can promote both conversation and quiet relaxation. We are a group that uses Third Spaces in the community, to foster, community, celebration and reflection. 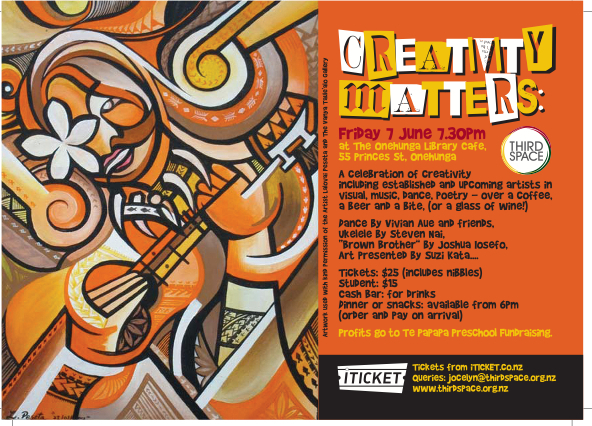 Come and join us at our next event on 7 June, at the Library Cafe in Onehunga. Or fill out the “contact us” so we can let you know future events, or press “follow” for our blog!